The ancient Romans built one of the greatest empires in world history. However, whereas the Roman Empire lasted from about 30 BCE to 476 CE, Ancient Roman civilization emerged long before, in the centuries after 800 BCE. This article deals primarily with Roman life and culture. For a more in-depth coverage of its history, look at the articles on the Rise of the Roman Empire, the Roman Empire and the Late Roman Empire. The term Ancient Rome refers to the city of Rome, which was located in central Italy; and also to the empire it came to rule, which covered the entire Mediterranean basin and much of western Europe. At its greatest extent in stretched from present-day northern England to southern Egypt, and from the Atlantic coast to the shores of the Persian Gulf. Rome’s location in central Italy placed it squarely within the Mediterranean cluster of civilizations. The most famous of these was that of the Ancient Greeks, but others included those of the Phoenicians, the Carthaginians and the Etruscans, plus several lesser-known peoples such as the Lycians. The civilization of Ancient Rome was rooted, directly or indirectly, in all these earlier culture. In its early centuries Rome was particularly influenced by the powerful Etruscan civilization to its north, from which it acquired many aspects of its culture. As Rome’s reach expanded, it came into direct contact with the Greeks. From then on Greek influence would become an increasingly important element within Roman life. However, the Romans would give Greek culture their own slant, giving it a new grandeur which can be seen in Roman remains throughout the empire. Ancient Roman society originated as a society of small farmers. However, as it grew more powerful and more extensive, it became one of the most urbanized societies in the pre-industrial world. At the height of its empire, Rome was probably the largest city on the planet, with more than a million inhabitants. The empire had a handful of other cities with several hundred thousand inhabitants, and many other large and wealthy urban settlements. These cities had some features which would have looked very familiar to us: high rise apartment blocks, overcrowded slums, busy streets, plazas, imposing public administrative buildings, and so on. 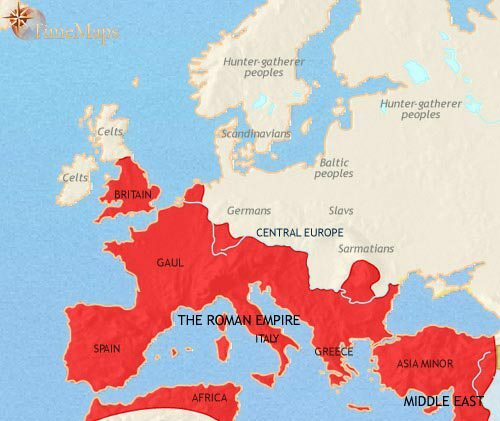 The Roman Empire contained around 2000 “cities”. For the Romans, cities were communities which ran their own affairs, and constituted the main building-blocks of the empire. Every free person in the empire belonged to a city – which may not necessarily have been where he or she was living at any given time, but was his or her “home town”. The Roman city was built around a forum. This was an open space surrounded by colonnades and public buildings. It functioned as a market place, political meeting point and social center. The public buildings surrounding it would include the main temple, the basilica (the main government building where the town council met and town administration was carried on), the law courts (if separate from the Basilica), and the main public baths of the city. Stretching away from the forum were the cities streets, forming a grid pattern so that a map of a city would look like a multitude of square blocks. Here would be situated the homes of rich and poor, the shops, cafes and workshops of the town, more temples and public baths, and a theater, maybe two. Unlike Greek theaters, Roman ones were large, free-standing buildings of semi-circular design, containing tiered ranks of seats. The city would be surrounded by walls, usually made of stone. Fortified gateways pierced the walls to allow people and traffic to pass in and out. Water was brought to the city, sometimes from miles away, along aqueducts. It was fed into public fountains dotting the city, from which poorer families drew their water; and also into private wells in the houses of the rich. The amount of fresh water available in an average Roman town was far greater than in later centuries, right up to two hundred years ago. Roman cities also had public drains and sewers to take the city’s waste away, and public toilets were available. Outside the walls was the amphitheater. Here, wild animal shows and gladiatorial fights were shown. Amphitheaters were built like the theaters, but were circular rather than semi-circular in design. Many cities were located on the coast or by a large, navigable river. Here, a harbor would be situated, consisting of quays built of wood or stone for loading and unloading vessels, and docks for repairing or building ships. Surrounding the city was the territory which it controlled. Hamlets and villages were scattered across the landscape, whose people came to the city for market or other special occasions. Villas of the rich were also to be found – large farmhouses set in country estates worked by slaves or tenant farmers. Some villas were truly magnificent, palaces set in beautiful parks. As in all pre-modern societies, the Roman economy was based primarily on agriculture. For the Romans, this was then typical Mediterranean farming of the ancient world, cultivating grains, vines and olives, and keeping sheep, goat and cattle. Landholdings were very small by modern standards, the majority no more than a few acres in size. An estate of 100 acres was considered large. In the late Republic, however, many wealthy Romans developed huge slave-run plantations. As the city of Rome grew into a huge imperial capital, its population was fed by grain imported from overseas. However, there was still a great demand for vegetables, olives, wine and other farm produce. As a result, the countryside near Rome was given over to intensive farming and market gardening. Manuals on agriculture were written to spread efficient methods of food production. Economically, the “Pax Romana” which the Romans established around the Mediterranean was very favorable to trade. Long-distance maritime trade was more extensive at the time of the empire than at any time before the nineteenth century. This expansion in trade encouraged the development of farms and estates growing crops for export, of craftsmen specializing in export goods, and the growth of highly organized trading operations spanning the empire. One fact which had a major impact on trade was the system of grain fleets which carried grain from Egypt and North Africa to Rome, to feed the population of the capital. This was set up by the emperor Augustus, so that the Roman poor – hundreds of thousands of them – could get free bread each day. Scholars used to think that this massive operation acted as a drain on the economy of the empire – it was, after all, paid for out of taxes. More recently, they have begun to view it as having acted as a huge stimulus to trade. The ships which carried the grain would also have carried other goods, which would have subsidized the long-distance trade of the empire. Quite apart from the grain supply, the sheer wealth which flowed into the enormous imperial capital would have boosted commerce and industry right around the empire. The volume of trade in the empire brought into being the most advanced financial system in the ancient world. Banking had been practiced in Rome since at least the days of the 2nd Punic War (218-202 BCE). The large-scale military operations of the later Republic also brought into being firms of contractors which were involved in supplying armies and undertaking tax-farming operations in the provinces. Associated with this was the rise of high finance, and what appears to be the arrival of modern-style stocks and shares: the firms of financiers were joint-stock companies issuing bonds and shares which apparently fluctuated in price, just as modern stocks do. This financial industry continued to be active into the imperial period, financing the grain fleets, large-scale mining and other major business operations. This scale of Roman commercial activity would have facilitated an expansion in industrial output, and there is strong evidence that this, too, was at a level not seen again in Europe until the Nineteenth century. The copper mines which developed in Spain, for example, were huge by pre-modern standards. Most industrial production took place in the small workshops of potters, blacksmiths, bronze workers, carpenters, leather workers, cobblers, lamp makers and other craftsmen. Family members plus some slaves would make up the workforce in most of these. However, some workshops were much larger. The armories which supplied the Roman army employed hundreds of workers, mostly slaves. Roman society changed enormously over time as Rome expanded from small city-state to huge empire Throughout almost all Roman history, however, the basic class distinctions of Roman society remained in place. At the top stood the senators – members of the senate (the council of state) – and their families. In early Rome, these were probably all members of the class of Patricians, a group of hereditary aristocrats; as time went by, however, membership of the senate became more broadly based, as men from Plebeian families were enrolled. Below the senatorial class came the equites. These were originally those in the army who could afford to own a horse (equus). Over time, however, they became a numerous “middle class” between senators and the rest of the citizen body. Below them were the ordinary Roman citizens. Their numbers grew vastly over time, from a few thousand to many millions; and spread right around the empire. An ubiquitous feature of Roman society was slavery. In fact, as Rome’s conquests multiplied, she became the most slave-based society before the rise of Atlantic slavery in the 17th century. Slaves would have been found everywhere, in the cities and in the country, and of course in the home. They worked in all kinds of businesses, and did all kinds of work – from unskilled laboring through to high level professional jobs. They had no legal rights – they were property, like cattle. But one thing they could, with luck, look forward to: freedom. Generation by generation, millions of slaves were freed and joined the main body of citizens, with all their rights. Some freedmen became very rich; many others made a moderate living in their trade. But all swelled the ranks of citizens. The father – the Pater Familias – was the head of the Roman family. In early law, he had complete control over his wife and children, with power of life and death over them. Even as adults, his sons remained under his authority. Later, the laws governing family life were greatly relaxed, and discipline in most homes became much milder. In fact, from late Republican times onward, Roman women lived much freer lives than their Greek predecessors had done. For example, whereas Greek wives had been unable to eat with her husband’s guests, a Roman wife was free to do so. Also, women could initiate divorce as easily as men. Young Roman men came of age about the age of 17, when he became liable for military service. In early times all men would be expected to fight in the army, and could be called up to do so for some of each year, until he was 40 years old. From the late Republic onward, however, serving in the army became a full-time profession, so unless they volunteered, ordinary citizens would not expect to serve. Parents arranged the marriages of their children. A man would usually move to his own house when he married. Although boys could marry 14, and girls at 12, most did not do so until they were older. After marriage, in well-off marriages the wife’s responsibility was to look after the home, and bring up the children, while the husband worked. In poorer households they would be needed in the family workshop. Young children of both sexes, and from a wide range of social backgrounds, attended small schools run by slaves or ex-slaves; in better-off households, they were taught at home, also by a slave or freedman. Schools were held in public places, such as the portico (open colonnaded area) of the forum. Children were taught reading, writing and arithmetic, by rote learning – reinforced by regular beatings! Older girls were excluded from formal education – though some Roman women were noted for their learning, and must have continued their education at home. For boys, schooling continued with mastering Latin and Greek grammar. Often, cities paid for a public teacher to perform this task – this was a well-respected post (even if often occupied by an ex-slave), and such teachers sometimes went on to take important jobs in the civil service. The sons of wealthy families who wanted them to take up a career in public life then progressed onto higher education. Here they would learn the art of public speaking – a vitally important skill if they were to persuade citizens to vote for them, or sway juries in court, or influence decisions taken in city councils or even the Roman senate. Large cities often paid for a teacher of “rhetoric” (as public speaking is called) to fulfil this task. Like grammar teachers, these were important men in the city, and could go on to high government office later on. Some teachers attracted students from all over the empire, with their schools becoming a kind of university. The two institutions of higher education in Athens, in Greece, the Academy (originally founded by Plato) and the Lycaeum (by Aristotle), continued to flourish under Roman rule, and specialized in the study of Greek philosophy. The earliest Roman houses were essentially small wattle-and-daub cottages with thatched roofs. This is hardly surprising as Rome originated as a collection of rural villages. By the time of the end of the monarchy, however, houses designed along Etruscan lines were being built. Early Roman dwellings were one-story buildings erected around a courtyard. The main reception room (the atrium) gave out onto smaller rooms – dining room (triclinium), office (tablinum), bedrooms, kitchens and other domestic areas. Many of the family rooms had painted walls. Later, under Greek influence, the courtyards of larger houses became small colonnaded (peristyle) gardens, complete with fountains and ponds. Later, some houses became larger in size and more complex in design, with two stories. The area around the atrium expanded to become a main block, and the garden was moved to the back (but still surrounded by wings with kitchens, servants quarters, storerooms and so on). All Roman town houses had toilets, which were built above sewers which discharged into a large public sewer to take the waste away from the town. In the cities, the poor lived in rooms above or behind their places of work. Craftsmen and shopkeepers rented out shops, workshops or cafes, plus the living accommodation which went with them. Some large houses were completely converted into either workshops or apartments. In large cities such as Rome, apartment blocks as high as five stories (or even more, before the emperor Augustus imposed housing regulations) were built, divided into many rooms. These would have had no water or toilets above the first floor, and life in them would have resembled living in the mid-19th century slums of London or New York. The lower stories were sometimes divided into larger suites of rooms, for well-off families. The main building material for houses was fired brick. Stone, marble and even an early form of concrete were used in the palatial mansions of the rich. Roofs were made of wood covered with terracotta tiles (terracotta is a type of clay). Houses had small windows, without glass but with wooden shutters. In apartment blocks, however, the windows were larger, as they were usually the only source of light. They sometimes had glass panes in them. The rooms were furnished with sparse furniture, mostly wooden chairs, couches, stools, benches and tables. Cupboards similar to those of today were also to be found, as well as chests of various sizes. The dwellings of the rural poor were small huts and cottages, with tile or thatched roofs. They were normally huddled together in hamlets or villages. The focus of Roman community life was always in the city, and so country villages were low-status places to live, despised by the city-dwellers. However, one type of country house was very desirable: the villa. Many of these were more or less large farmhouses, the center of a working farm. Indeed, most villas were the headquarters of a large farm or country estate. Some, however, were mansions designed primarily for a leisured lifestyle. Such houses, owned by wealthy families, were often located within easy reach of a city, and were used as retreats from the stresses of urban living. Villas were similar in design to large urban dwellings, but were more spacious. Some were laid out with three wings, others completely enclosed a large inner space. This was often used as a luxurious garden. The rooms were likely to boast mosaic floors and painted walls. Roman clothing was almost identical to that of the Greeks. Men wore a tunic tied at the waste. On formal occasions they would also drape a large piece of cloth, called a toga, around themselves. Towards the end of the Roman Empire, although togas continued to be worn by senators and high officials, they went out of fashion for everyone else (by this time all free people were Roman citizens, so it had ceased to be a mark of distinction). Barbarian influences began to be felt, with long-sleeved tunics and trousers became popular. Highly decorated cloaks fastened by a broach also came into vogue. Most men wore their hair short. Throughout the republic and early empire, they were clean shaven. From the second century onward, older men adopted the Greek fashion for growing a beard. In the later Empire men of all ages wore beards. Women wore a stola, a long tunic tied at the bust and falling to the ankles. They too could drape large pieces of cloth, looking like a toga but called a palla, over themselves. Women’s hairstyles varied over the long period of Rome’s history. In earlier times, women grew their hair long, then gathered it into a bun. Under the early empire, upper class women’s hairstyles became more elaborate, with the hair often braided before being gathered back into a bun. Later, hair styles were more elaborate still, with many curls piled high on the head. Wealthy Roman women also wore a lot of make-up, at least during the empire; face creams and perfumes, red ocher for the lips and cheek and soot for eyeliners were all applied with the aid of a polished metal mirror (plus slave). Children’s clothing consisted of short tunics, usually but not always tied at the waste. Leather sandals were worn on the feet. Romans of all classes, like people of all races and times, enjoyed dining with friends, eating, drinking and chatting in the privacy of their own homes. In wealthy household, large and elaborate banquets were the norm under the Empire. For educated Romans, reading was a common habit: leisured learning (otium) was an important part of the idealized gentleman’s life. Books – or rather, scrolls – were expensive. They were copied by hand (this was long before the days of printing) by groups of slaves laboring in the workshop of a book publisher. In Roman times, only the well-off could afford this pastime. All Roman, of both sexes and all classes, enjoyed visiting the public baths. These were not just places to go and bathe, but also to take exercise, have a massage and above all to socialize. Drinking and gambling with friends in the many inns was also popular with many men. Public entertainment was to be had at theaters, where plays by Greek and Latin playwrights were staged. Chariot races were put on at the racecourse, or circus (the most famous of these was the Circus Maximus, at Rome). At frequent intervals, bloody shows were put on at the amphitheater. Here, armed men fought animals, or gladiators (swordsmen) fought each other; or unarmed criminals condemned to death were put into the arena to be eaten by lions. It was only with the coming of Christianity as the official religion of the empire, towards the end of the Roman period, that the worst of these shocking shows – gladiatorial combats – were abolished. The Roman Republic governed Rome as it changed from single city-state to enormous empire. As its power expanded, the republic’s leaders met new challenges by adapting old institutions to meet unforeseen challenges. The stresses and strains of growth eventually led to the breakdown of the Republic, but the Augustan settlement which opened the curtain on the Empire was a masterpiece of practical adaptation. The Republican government involved a mix of different institutions – the magistrates, above all the two annually elected consuls; the senate, a council of state composed of the most important men in Rome (senators); and the popular assemblies, which elected the magistrates and had the final say as to whether Rome went to war or not. Most of these institutions carried over into the Empire. However, they were adapted to give the emperor supreme command over the army, as well as the final say in what legislation was permitted. They were also fine-tuned more to the needs of governing a large empire than of running a single city-state, which is how they had originated. The Roman army was the most formidable fighting force of its day. It changed considerably over the long period of Roman history, but for most of this time it was based around the legion. This was a body of some 4000-6000 infantry soldiers (depending on the period), divided into units of 100 men (centuries). This division into small formations gave the legion a flexibility unmatched by its opponents; and combined with innovative tactics and sound discipline, it endured as an unmatched fighting force for many centuries. The Greeks had developed legal codes, and the Romans followed their example. In the mid-fifth century BCE they published 12 tables of laws, which were put up for public display in the Forum. From these early laws there developed, over the centuries, a huge body of law, dealing with every aspect of public and private life. Roman law guaranteed all citizens a fair trial. There were several courts, each presided over by different magistrates and each dealing with different kinds of cases, some civil, some criminal. In some courts, juries, made up of ordinary citizens, could by 100-strong. In criminal cases, it was up to the victim to bring an accusation of wrongdoing, there being no public prosecutor. Punishments for the most serious crimes were execution, and for lesser ones, flogging. The law protected a whole range of basic rights for citizens. The Romans developed the principle that all citizens were equal in the eyes of the law, and that their persons and property were protected from arbitrary demands by the state. These rights, originating and evolved within the Republic, were not taken away under the emperors, at least for the majority of the population who were not within the personal reach of the emperor. Even a Jew in a far away province who happened to possess Roman citizenship could cry, “I appeal to Caesar”, and to Caesar he was taken. The great legal digests of the Late Empire enshrined these principles and passed them on to future European civilization. Roman religion was very similar to that of the Greeks. Like the Greeks, the Romans worshiped a pantheon of gods and goddesses, headed by the chief of the gods, Jupiter. Other gods included Minerva, goddess of wisdom and learning; Mars, god of war; Venus, goddess of love; Ceres, goddess of the Earth; and Pluto, god of the underworld. As well as these major gods, numerous lesser deities, gods of hearth and home, and forest and field, populated the spirit world. Roman religion placed great emphasis on proper rituals – it was important to do things right. Roman priests were, by and large, not professional, full-time religious practitioners. They tended rather to be the leading people in their community, magistrates and senators. Unlike Greek religion, Roman religion had a strong moral dimension. This was to do with behaving in an honest and dignified way towards others, keeping oaths and agreements on the shake of a hand, and in displaying courage and fortitude when misfortune struck. The Romans were very superstitious, always looking for good or bad omens before embarking on a course of action. Like the Greeks, they also consulted famous oracles – priests or priestesses at certain shrines who, in a trance, uttered messages from the gods. One innovation that the emperors introduced was their own cult, emperor-worship. To what extent this was a real religion rather than an outward show of loyalty is difficult to say; however, in most Roman towns a temple to the emperor would be among the larger buildings. As with Greek religion, Roman religion was not aimed at meeting private spiritual needs – it was a public, outward thing. As time went by, new religions and cults became popular in the Roman world: the Eleusian Mysteries and cult of Orpheus from Greece; the cult of the Egyptian goddess Isis; the religion of Mithras, from beyond the empire, in Iran; and later, Christianity. Despite (or because of?) often fierce persecution, Christianity spread around the empire, and by the third century Christians probably made up a sizable minority of the population. However, it was the conversion to Christianity of the emperor Constantine, and the favor bestowed on the Christian Church by succeeding emperors, that turned it into the most popular religion in the empire. In the 380s it was made the official religion of the empire, a development which would have a huge impact on the future history of Europe. Roman art was closely related to late Greek art – indeed, as the Romans conquered more and more Greek cities, more and more Greet art found its way to Rome. The same is true of Greek artists, who found in the Roman ruling classes keen patrons of their work. Culturally, the Roman period is to a large extent an extension of the Hellenistic period, especially in the eastern parts of the empire. Nevertheless, Roman sculpture in particular has an unmissable characteristic all its own. The sculptural portraits of leading Romans of the late Republic and early Empire are simple and dignified, and above all startlingly realistic. We really do know what Julius Caesar looked like! To see them “in the flesh”, so to speak, is an awe-inspiring experience. What is true for art is even more true for architecture. One can see Greek influences powerfully at work in the buildings of Ancient Rome, but transformed into a uniquely Roman style. There was nothing in Greek architecture similar to the arched facades of the Colosseum or of the theater of Pompey; nor to the arched construction of the great Roman aqueducts, or the triumphal arches which adorn many Roman cities. The arch is a new innovation in Roman architecture, reflecting Roman engineering capabilities in solving the problem of carrying greater weight. The same is true for the dome, which appeared most famously in the Pantheon, in Rome, and which allowed Roman architects and builders to span much greater spaces than before. The theme here is size and grandeur – the Romans built big to reflect their power and confidence. Roman literature is written in the Latin language. The Latins were a people who had settled in central Italy some centuries before Rome was founded; Rome was originally one of their towns, and although the Romans came to be of somewhat mixed Italian stock (Latin, Sabine, Etruscan), they spoke the Latin dialect. Writing came to the Latins (as for other Italians) via the Greeks, and early Latin writers modeled themselves on Greek precursors (when they were not actually translating Greek works into Latin). However, as the Republic neared its end, and the Empire lived through its first century, a group of Roman writers turned Latin into a great literary language in its own right, which later ages admired enormously, and sought to emulate. One of the extraordinary features of much Latin writing is that, to a degree probably without precedent in any other literature, much of it was produced by busy politicians. Some of these reached the highest eminence in their own turbulent lifetimes: Cicero, Caesar, Seneca (all these died violent political deaths). Other writers did not make quite the same mark, but still had successful careers in public service: Sallust, Varro, Tacitus and Pliny the younger, all successful senators; and Suetonius and the Pliny the elder, both senior civil servants. They found time in their busy lives to produce a great volume of writing – commentaries on philosophy and politics, histories, biographies, satires, speeches, letters, drama, and works on science and nature. Throughout all this literature there permeates a realism and reflectiveness which comes from the practical lives these men led. Other Latin writers of the period lived more conventional literary lives: the poets Virgil, Catallus, Horace, Ovid, Martial and Juvenal; the historian Livy. In fact these too were all near the seat of power, but as writers, not as politicians. Later writes continued the tradition of combining politics with writing – most notably an emperor, Marcus Aurelius, who jotted down his thoughts on philosophy. Right at the end of the Roman period, Ausonius the poet, Symmachus the man of letters and Boethius, the philosopher, all held high office while producing literature which is still read today. Meanwhile, in a completely different social setting, an entirely different genre was being produced. This was the writings of early Christian thinkers. Most of these spoke and wrote Greek, but from the third century onward some major Christian Latin writers appeared. Their works, of encouragement and exhortation, theology and pastoral concern, are still regarded as classics of Christian literature. The elegant, “upper class” literature of Rome and the more urgent literature of the Christian Church come together in the works of St Augustine of Hippo. He was a man right at the top of Roman society, and a deeply committed Christian. He wrote works reflecting on his life and times, and in doing so greatly influenced western thinking for centuries to come. Roman thinkers looked to Hellenistic philosophy for inspiration. The Stoic school of thought, which taught that it was duty for individuals to bear life’s trials with dignity and calm, was particularly popular in Rome. From Cicero, in the late Republic, though Seneca and later Marcus Aurelius, under the Empire, Stoicism continued to exercise a strong attraction over Roman minds. Epicureanism was also popular in some circles, with poets such as Lucretius championing its teachings. Like Stoics, Epucureans believed that life is ultimately without hope, and that one should focus on living daily life in a positive spirit. A major philosophical strand of thought in the later Roman empire was Neoplatonism. This taught that there was a “being beyond being” who created and ordered all things, and that humans should strive to become one with this being through practicing virtue and asceticism. Given the large overlap between the Hellenistic and Roman civilizations, it is sometimes hard to disentangle which civilization took some technological steps. In a sense it doe not matter, as Rome rose to power within a Hellenistic context, and carried forward the Hellenistic culture a further few centuries. Some of the greatest technological achievements of the Roman period were in construction engineering. These rested on the development of the first form of concrete in history, a step that took place in southern Italy in the 2nd century BCE. This material (which used volcanic lava as its base) was crucial to Roman architectural innovations such as the arch and the dome. These allowed Roman engineers to span much larger spaces than ever before. Huge stone bridges, the first of their kind, were thrown across rivers; multistoried aqueducts marched across valleys; and awe-inspiring buildings such as the Pantheon in Rome, and much later the Cathedral of S. Sophia in Constantinople, used domed roofs to enclose larger areas than any other building until the 16th century. The Romans were clearly adventurous and highly skilled engineers. More than anything else, this is seen in their roads, which ran for hundreds of miles across all sorts of terrain, and played an important part in knitting the empire together so effectively. Laying out these roads involved advanced surveying techniques, using instruments which were adapted from those used by astronomers to measure angles. The Romans seem to have been the first to use mechanical means for the ubiquitous task of grinding corn, which previously, had always been done by hand. Dating from the second century BCE, heavy millstones have been found which would have ground grain with the aid of animal power. The Roman world saw the next major step along this path with the building of the first water mills recorded by history. These were used from the first century BCE to grind grain, and were described by Roman writers such as Vitruvius and Pliny the Elder. They probably originated in the Greek-speaking eastern empire, but in the first century CE, one mill, in southern France, had no less than sixteen overshot water wheels, fed by the main aqueduct to Arles. It has been estimated that this mill could supply enough bread for the entire 12,500-strong population of Arles at that time. Some later mills were built as sawmills, for the industrial-scale cutting of timber. There is also evidence for a kind of mechanical harvester or reaper at work in Roman Gaul. Roman science was an extension of the Hellenistic scientific activity – indeed, most of the scientific thinkers of the Roman period were Greeks (or Greek speakers) living in the Greek-speaking eastern part of the empire. One exception was Pliny the Elder, a senior Roman official writing in Latin. He compiled a huge collection of facts (interspersed with many fictions!) about the natural world. In many cases he sought to explain natural phenomena – for example, he was the first to realize that amber is the fossilized resin of pine trees. Ptolemy of Alexandria (one of the great cities of the Hellenistic world) systematized Greek knowledge of astronomy. His theories of the movements of the heavenly bodies would have a profound influence on later European thinkers. The doctor Galen also systematized Hellenistic anatomical knowledge; but he also extended this knowledge considerably, based on his own careful dissections of animals. He was the first to assert that veins carried blood, not air; and his writings formed the primary foundation for Medieval medical theory and practice. The rise and fall of Ancient Rome formed a crucial episode in the rise of Western civilization. Through Rome the achievements of ancient Greek civilization passed to Medieval Europe – with unique Roman contributions added. Roman architecture, sculpture, philosophy and literature all built on Greek models, developed their own distinct elements, and then left a legacy for later periods of Western civilization to build on. However, it was in law and politics that Roman influence can be felt most strongly today. Much European law is still derived from Roman law. The ideas of equity (true justice), equality before the law, citizens’ rights and elected officials, whilst originating with the Greeks, were all taken further by the Romans and have came down to us in a basically Roman form. We will deal further with the impact of Rome when we look at the roots of Western civilization. History of ancient Europe at the time when ancient Roman civilization flourished. History of the ancient Middle East, showing the role the Roman empire played in that region.